Members of the far-right “Proud Boys” clashed with demonstrators, culminating in a savage beating. The NYPD arrived and did nothing. Now New Yorkers are wondering why. Members of a far-right group were filmed not only beating up a protester, but also bragging about it afterwards. The NYPD arrived on the scene, but made no arrests, and now many New Yorkers are wondering why. 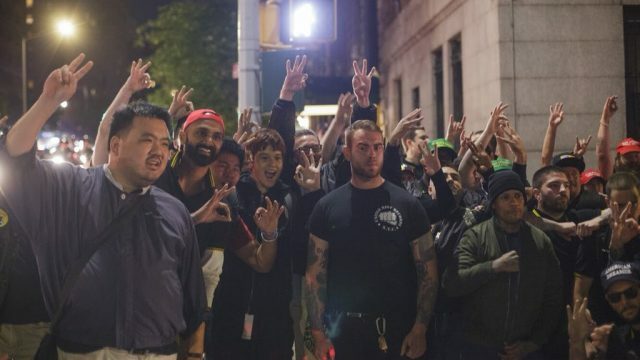 This all took place outside the Metropolitan Republican Club, the venue for a speech made by Gavin McInnes, founder the Proud Boys, a Potemkin collective of self-described “Western chauvinists”. Former Proud Boys member Jason Kessler helped organise the infamous “Unite the Right” rally in Charlottesville. In analysing the clip, the anti-extremism watchdog, the Southern Poverty Law Center (SPLC) identified three of the attackers as Proud Boys members. Three men were also arrested in what seems to be a separate incident after McInnes’s talk, according to the NYPD. The SPLC believes that those three assailants were left-wing protesters. The NYPD didn’t answer questions about the videotaped beating.